This amusing memoir by D.G. 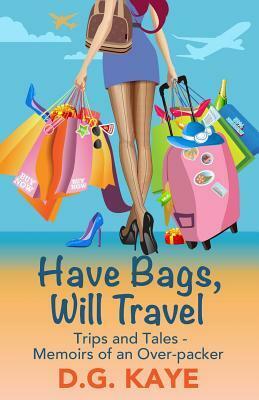 Kaye is all about the difficulties faced by a shopaholic whose idea of travel centers largely around shopping and getting all her fantastic purchases home without paying excess baggage costs. I could relate to this book really well because I am both of the things the author is; I am a germ fanatic and I love to shop. My shopping also comprises of bulky objects because I collect antique and vintage dolls and books. Have you ever tried to pack three teddy bears, two porcelain dolls, gifts for everyone you know and about twenty vintage books into your return suitcase without it being overweight? I have so I can relate to D.G. Kaye's weakness for shoes and having to get them back home. I really laughed at the descriptions of trying to make do with the tiny bathroom facilities on an overnight flight without touching anything. I recently bought my Aunt, who was travelling overnight to Dubai, a pair of soft slippers to wear on the aeroplane so that she would not get dirty socks. D.G. Kaye has traveled to some interesting places, and it was entertaining to read about some of them and see them through the eyes of a shopper who is focusing mainly on what she can buy. Her reflections on Las Vegas, a city I have never visited, were particularly interesting. A lovely book which is a light and amusing read.